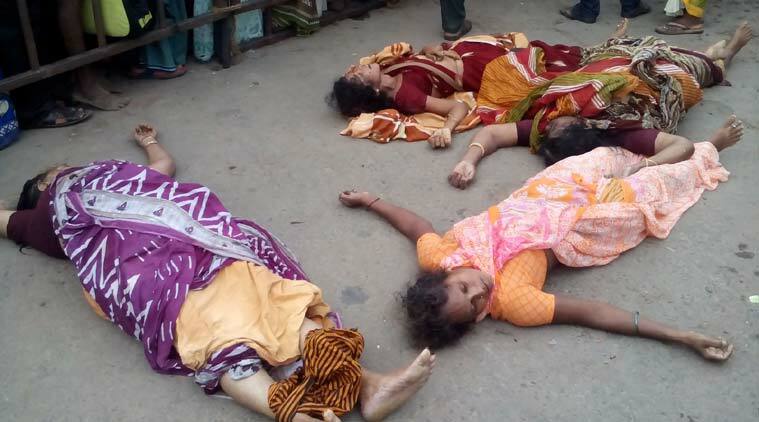 At least 29 people were killed and over 60 injured on Tuesday in a stampede during the mahapushkaram, a Hindu religious bathing festival on the Godavari river bank, in Andhra Pradesh. The incident happened around 8am at Rajahmundry soon after chief minister Chandrababu Naidu and his family took the holy dip and left the place. 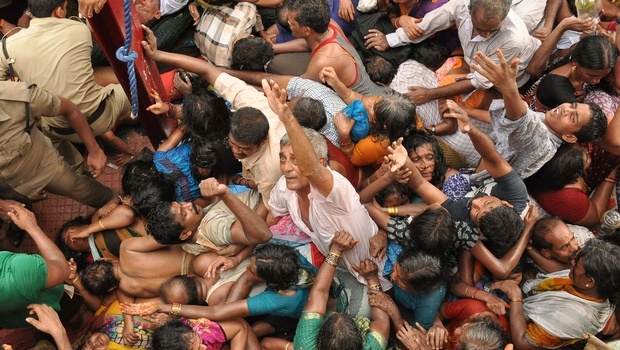 Some pilgrims trying to retrieve their shoes which had fallen off in the rush triggered the stampede as tens of thousands of people pushed forward to bathe in the Godavari on the first day of the festival, police said. Some witnesses said several devotees tried to climb a wall along the popular pushkar ghat while others pushed forward, triggering a stampede. Naidu who has been camping in the town from Monday to inspect the arrangements, visited the mishap site and the hospitals. “It is unfortunate that such loss of life occurred even after taking all precautions. The situation is because of people thronging one ghat. We request people not to panic and use other ghats to avoid overcrowding. Safety of pilgrims is top priority for us and we will provide all possible assistance,” Naidu said. A visibly shaken Naidu also announced a compensation of Rs 10 lakh to the families of the deceased. "We will probe how the incident occurred and necessary action will be taken against those responsible," he said. Prime Minister Narendra Modi spoke to Naidu over the phone and later tweeted - "Deeply pained at the loss of lives. My condolences to the families of the deceased and prayers with the injured. I spoke to AP CM Naidu and discussed the situation with him. State government is working to restore normalcy." Telangana CM Chandrasekhar Rao, who took the pushkaram dip in the Godavari at Dharmapuri in Telangana, also expressed shock over the tragedy. About 24 million people are expected to take part in the festival at varying points along the Godavari, which flows through the recently-bifurcated states of Andhra Pradesh and Telangana. About 275 ghats have been developed by AP in the twin districts of East and West Godavari but the rush is at the pushkar ghats in Rajahmundry, where the government also arranged various events like fireworks. Officials said a small place like Rajahmundry could not cope with the rush and the situation became almost unmanageable. Some pilgrims said ambulances took time to reach the site because the roads were overcrowded with people. Devotees believe a dip in the river can rid them of their sins and thousands of them, riding in buses, trains and other vehicles, started reaching the pilgrimage centre two days ahead of festival. “There is a false belief that taking a holy dip in the river on the first day of the festival will be more auspicious,” said Swamy Swaroopanand, a holy man. V Satyanarayana, a pilgrim who was at the site, said the stampede lasted nearly 20 minutes. “This is an unfortunate incident even after all the precautions taken and monitored by the CM himself. We are rushing medical teams to help the victims,” health minister Kamineni Srinivas Rao said. Telangana chief minister Chandrasekhar Rao, a bitter political rival of Naidu, said he was shocked and hoped there would be no more untoward incident during the rest of the 12-day festival. Deadly stampedes are fairly common during Indian religious festivals, where large crowds gather in small areas with few safety or crowd control measures. In October 2013, a stampede in Madhya Pradesh killed more than 110 people, mostly women and children.